How many pounds of minerals are required by the average person in a year? Where can I find information about mineral commodities? For statistical information about mineral commodities, visit the USGS Commodity Statistics and Information website. 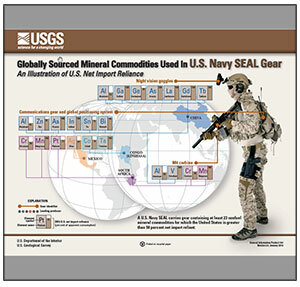 For locations outside the United States, the USGS International Minerals Statistics and Information website is the best starting point. How much silver has been found in the world? Of the 1,740,000 metric tons of silver discovered to date, 55% is found in just four countries on earth. All the silver discovered thus far would fit in a cube 55 meters on a side. 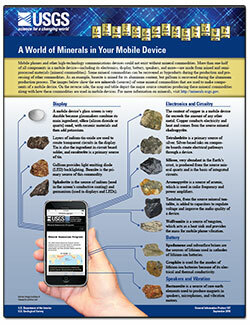 Learn more at the USGS commodity website for silver . How much gold has been found in the world? 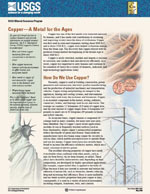 How much copper has been found in the world? How large is a lifetime supply of minerals for the average person? At today's level of consumption, the average newborn infant will need a lifetime supply of 800 pounds of lead, 750 pounds of zinc, 1,500 pounds of copper, 3,593 pounds of aluminum, 32,700 pounds of iron, 26,550 pounds of clays, 28,213 pounds of salt, and 1,238,101 pounds of stone, sand, gravel, and cement. How do we extract minerals? Does the USGS have reports on the background levels of elements in soils and other surficial materials? Brainard, Jamie ; Nassar, Nedal T.; Gambogi, Joseph; Baker, Michael S.; Jarvis, Michael T.
Brainard, Jamie, Nassar, N.T., Gambogi, Joseph, Baker, M.S., and Jarvis, M.T., 2018, Globally sourced mineral commodities used in U.S. Navy SEAL gear—An illustration of U.S. net import reliance (ver. 2.0, January 2018): U.S. Geological Survey General Information Product 183, 2 p., https://doi.org/10.3133/gip183. 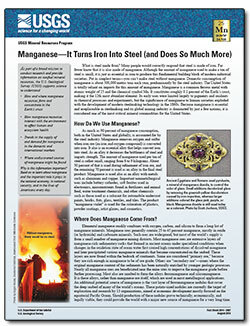 Manganese: it turns iron into steel (and does so much more); 2014; FS; 2014-3087; Cannon, William F.
Kropschot, S.J. ; Doebrich, Jeff L.
Lead-soft and easy to cast; 2011; FS; 2011-3045; Kropschot, S.J. 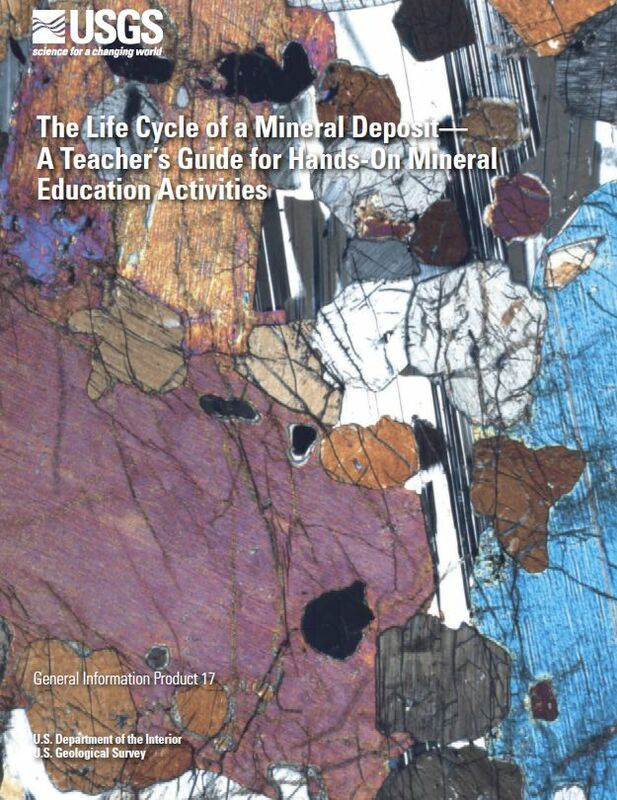 ; Doebrich, Jeff L.
Minerals and mineral resources are a part of our everyday lives. 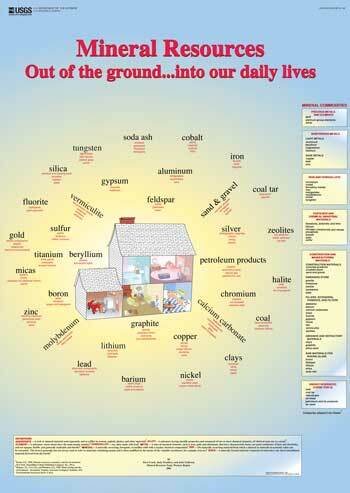 This poster depicts a home and shows the different mineral(s) and mineral materials used to make the various products found in the average home. Minerals are found everywhere in our daily lives. 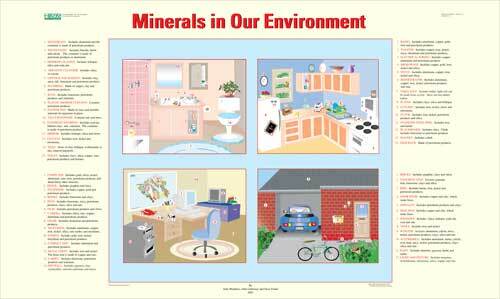 This poster depicts numerous items found throughout a home, and the mineral(s) or mineral resources used in the ingredients of, or construction/manufacturing of those items. Designed for K-8 Teachers this poster can be scaled and is printable at 36" x 60" and legible at 11" x 17" in size. Earlier this year, Apple’s iPhone celebrated the 10th anniversary of its introduction to the world, an event that fueled a transformation within the technology and communications sector. This revolution would influence billions of smartphone users around the world forever altering many aspects of human life. The naturally occurring material from which a mineral or minerals of economic value can be extracted. Usually minerals, especially metals, are mined first in ore form, then refined later. 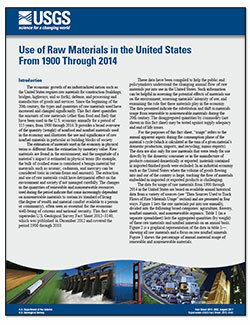 The U.S. is increasingly reliant on supply of mineral raw materials from other countries. Advanced technologies are increasingly making use of nearly the entire periodic table of the elements. Dynamic studies of critical and strategic mineral supply and demand can identify emerging potential supply risks. Sample of eudialyte (pink) within layered vein consisting of quartz, albite, and sodic amphibole, Dora Bay, Alaska. Sample of coarse-grained, tabular bastnäsite within matrix of ferruginous dolomite, Birthday Claim, Mountain Pass, California. A uranium-vanadate mineral in calcrete. This sample came from near the Sulfur Springs Draw in Texas. USGS conducted an assessment of uranium resources in this region in 2015. Why are arsenic and mercury associated with California's gold mines? What types of arsenic and mercury contamination can be directly related to historic mining?